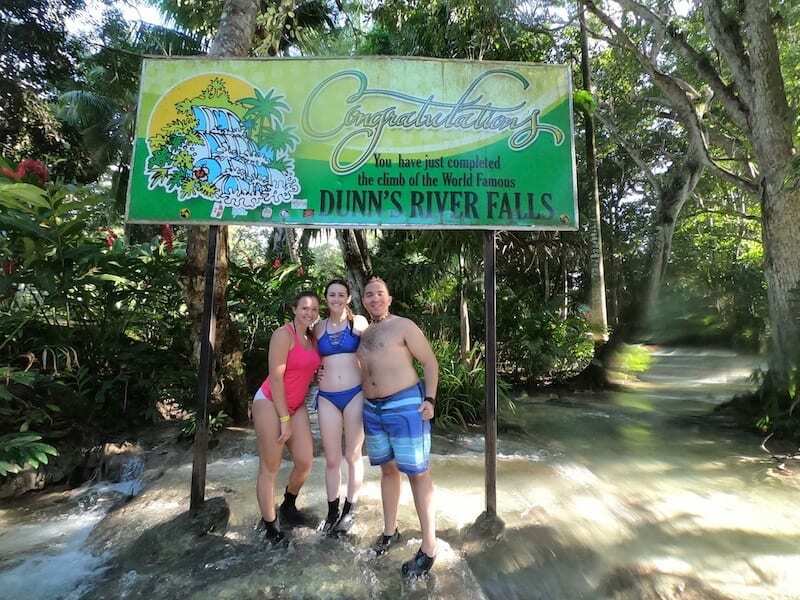 Yesterday we went to Dunns River Falls in Ocho Rio. The park fulfilled our craving for outside excitement and adventure aside from all of the snorkeling and SCUBA diving we’ve all gotten to accomplish — it was the perfect mix of water, adventure, and land for everyone. While at the falls we ran around for some time up the river with heavy, hard hitting water trying to wash us away. Many of us left with shoes filled with gravel, or stomachs filled with water. The funniest part was that Sydney almost lost her swim suit while trying to climb up the hardest part of the falls, where water practically stripped her down but, she was successful at surfacing with all the right parts covered. Overall it was a really great time. After going to the falls, we all gathered back into the bus and went into town for our trip to Ocho Rio. I think all of us were excited to go and experience the market, get souvenirs and try to adapt to Jamaican culture. There was some street music accompanied with the street merchants trying to haggle you on some of their crafts. Paul, I have to say, was THE BEST at bargaining with the locals to get the best price. Everyone seemed pretty content to be back on the bus going back to Discovery Bay. Above, is Fay, Nick and I after we conquered Dunn’s River Falls. This past week has been really exciting and I’d have to say the best parts were Rio Bueno (a snorkel/ dive spot) and Dunns River Falls. A highlight of Rio Bueno was getting to get some pretty clear pictures of fan coral, and feasting on some lionfish Professor Warren caught for lunch. I also learned how to remove the scales off of a fish pretty easily, so my dad will be excited to have a fish cooking partner once the weather is nicer on Long Island this summer. Room 2 is sad today because Sharmila is leaving with Dr. Amber, a scientist whose joined in on the professors research project here at Discovery Bay. However, in order to have one last hurrah, we all stayed up the latest we all have this trip (12am) and enjoyed a night full of gossiping about our lives, and getting to know each other more. Some true roommate bonding. This morning we all snorkeled and SCUBA dived again and some people reported back to have seen a sea turtle but I sadly didn’t see it. Pretty exciting though! This Jamaica trip has really been incredible, and I will say traveling to a foreign country, AND flying alone both for the first time was really scary at first and I tried to mask my fear, but this trip has made me much more comfortable discovering new things. I’m sad that in just 5 days I’ll be sitting on a bus on the way to an airport right about now going back to the cold weather. My parent will definitely not be happy about how much I’ll depend on my space heater the first few days back as I acclimate to the cold of New York. All in all, I will be excited to be back in my bed surrounded by my family and friends, and not get any mosquito bites for the next few months, even if it isn’t Discovery Bay and 80 degrees. Jessica, remember when you lost your suit in the ocean? the bottoms too! No Title?! Kelly, I guess you weren’t kidding about the starving after all. Not being able to eat allergy free meals has really affected your brain cells. 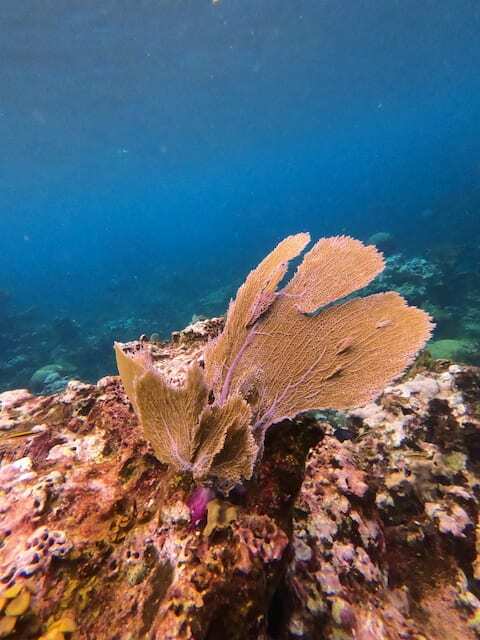 I must say I am a fan of your fan coral photo. We are proud that you were able to get out of your comfort zone and experience this incredible learning opportunity in Jamaica. Your bed and heater are waiting for you! Also lots and lots of FOOD!